32 Build | Welder Series Inc. Updates on our ’32 Ford build. After some reflection, a shortened “OUR WORK” could have become a shortened “OUR WRECK”. Somewhere between Syracuse and home, and then again somewhere between home and Louisville, the turbulence at the back of the car was working the frame and breaking the weld. It was a challenge to weld the thin frame to the heavier wall spreader bar, and every time it broke off, I had to clean and re-weld it where it had already been heated. Suffice to say, I was ready for a revision. The pieces started out like this. 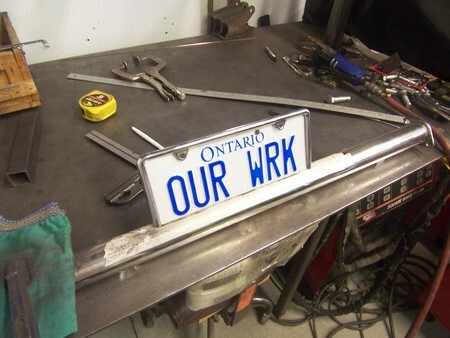 The lower part of the license plate is not cut off; it slips into a slot cut into the spreader bar. The back lower edge of the surround plate was chamfered so that the front edge could sit flush with the spreader bar tube to make welding cleaner. I put a slight radius on the vertical plates where they meet the tube. I used some washers stacked and clamped tight to form the side plate around. This is just a fusion weld – no filler. Just sitting on the spreader bar, getting an idea of the angle I want it to sit at. I’m ok with the weld showing – it matches the rest of the car. I clearanced the frame for the O as well. I put a bit of a radius on the corner to give it more of a stamped look. Here’s the original frame welded to the spreader bar. Over 40,000 miles or so, the 32 had developed a little clunkle (“clunk” + “rattle”) that was driving me batty. The severity of the rattle was not dependant on the size of the bump, or how fast I was driving, or any other variables that I could vary. I could make it happen by jumping on the front passenger side frame rail, but not the driver side frame rail. Are any exhaust brackets broken? Are the emergency brake cables thwapping on the floor? Is something clunking around under the seat? I have a power outlet built in to the front of the seat, and a while ago I noticed that the wires were not secured to anything and would click on the floor sometimes. Is the heater/ A/C unit secure? Are all the vents secure in the dash? Does the noise happen whether the windows are up or down? Sometimes the glass can clunk side-to-side when it’s down, if the whiskers don’t hold the glass as tight as the upper channel. Also, check the power window motor – maybe it’s come loose? Moving to the outside, I checked every bolt I could see. Sometimes a click can be caused by a bolt that’s binding and just releasing at a certain point, or the threads are sort of riding at the edge of a hole. I checked the radiator support rod brackets against the firewall, I checked the air cleaner, I checked the headlights… I checked all those things again. Ready for the spoiler? When I was grinding the boxing plate welds where the engine mounts meet the frame, I must have sneezed at one point and taken off more than necessary. There was a tiny spot where the vibrations of the engine travelling through the mounts to the frame had worked a stress crack, and going over a little bump or jumping on the frame rail would cause the boxing plate to flex just enough to create a little click… kind of like a mason jar lid. I was able to go over the spot with the tig, and now I’m no longer canning! It’s nice to be able to focus on something other than that little clunkle. What are some noises that you’ve discovered in your hot rod? It's been winter for a little while up here, but just recently has the snow been starting to stick around longer than past the mid morning sun. Setting up axle centerline on the '32. This is one of the most important measurements to take - it will look "wrong" if the tire isn't centered in the wheel well. I also assemble some front suspension components. Installing the Ride Tech shockwaves, Currie 9", and rear four link kit. How we mounted the body on our '32 build. Paul and Dorothy Horton have put some miles on hot rods in the past, but nothing will compare to the road trip they're beginning on Saturday. What we were finding in the '32 is that just because the pressure in the bags was 50 psi, didn't mean the car was sitting where we thought it was. Enter the ride height gauge. From 2004... We installed stock door handles, and tried to get them as close to the stock location as possible.